A major deficiency in most modern armies is a lack of large numbers of inexpensive and inconspicuous light commercial trucks. Future wars will be fought along major roads, which cover most of the modern world. These roads will be filled with civilian vehicles full of confused refugees and local militia. As a result, common commercial vehicles are excellent reconnaissance and general purpose platforms, a role once filled by jeeps. As jeeps were retired, the US military utilized modified Chevy Blazer SUVs, called CUCVs, but they were phased out in favor of larger HMMWVs (Hummers). SUVs can be used, but they are less common and cannot carry outsized cargo like trucks, while troops in the rear cannot easily fire or dismount. The engine may be modified to burn fuel common with an army, but a big engine is unneeded, like the CUCVs had. Small modifications to a light commercial truck may be in order, like a tinted bulletproof windshield and non-shatter polycarbonate glass elsewhere. A fold down wind shield would be nice to fire weaponry. Perhaps some light armor is needed in the doors, but the idea is to avoid adding too much weight and looking unique. These trucks will rely on speed, agility, and "civilian camouflage" for protection, not armor. This is not a combat vehicle, but a reconnaissance and general purpose platform like the old jeeps. Any small truck can be used, but Toyotas (right) are most common throughout the world and are also made in the USA. What color trucks? Probably different dark colors to blend in with civilian traffic. In addition, slightly different models can be purchased each year so that no one type becomes associated with an army. This may irritate Generals since they will not look uniform when lined up in a row. Soldiers should not hide as civilians in combat zones so these trucks should be clearly marked. For example, "US Army" can be painted on doors. In addition, something may be painted on the cab roof for identification by aircraft. However, enemy forces will not recognize it as a military vehicle until it approaches very close. In counterinsurgency operations with an elusive enemy, all markings may be removed for the protection of peacekeepers inside. The US military has no such platform, and often uses Hummers (below) for this role. Yet Hummers are large and unique, which allows them to be spotted a mile away. Even at night, their large, loud engine announces their arrival. This makes them easy targets for roadside bombs and ambushes. They are also too wide for narrow roads common in Third World cities and cannot fit inside most helicopters. It will be difficult to ambush a Toyota as insurgents need several seconds to ready themselves before springing an ambush or exploding a bomb. By the time they recognize the Toyota has Army markings, it has sped past possibly gunning them down. Toyotas are excellent for scouting ahead of convoys and conducting reconnaissance, relying on stealth rather than light armor for protection. They are less intimidating to locals and will deter attacks as insurgents avoid planting bombs or preparing ambushes in areas with civilian traffic knowing that any light truck passing by may include peacekeepers. Light trucks are excellent for armored columns as well, dashing ahead to perform reconnaissance. Enemy forces are unlikely to fire upon light trucks that sport no weaponry and may carry civilians or their own soldiers. This allows light truck recon soldiers to note activity and turn and flee whenever they encounter enemy forces. Recon soldiers may park their truck on a busy roadside to keep watch, while enemy aircraft fly overhead and enemy armored units roll by and pay no attention since the roads are full of such vehicles. Another advantage is that hybrid diesel-electric Toyotas have appeared on the commercial market that consume less fuel, about one third as much as a Hummer. However, such vehicles can run on just electricity for over 20 minutes. A military version would have a switch that allows it run only on electricity whenever scouts want to move in a stealth mode, with no engine noise or infrared signature, while the body of the cab hides the soldier's infrared signature. This allows them to sneak around at night in total silence. Even if discovered at checkpoints by startled soldiers with flashlights, they can start up their engine and dash away. The soldiers may not fire or report anything as they will assume they discovered another panicky pair of lost civilians. When a loud, large armored vehicle is used for reconnaissance it is spotted a mile away, even at night. An enemy can take cover and allow it approach and destroy it with a tank round or RPG fire. This is why jeeps were used for most reconnaissance during World War II. They were small, fast, and less noisy than lumbering armored vehicles. The modern world now has over a hundred million civilian vehicles, so during rapid offensives roads will be full of civilian vehicles. Small trucks with two scouts each can approach within meters of enemy activity, ideally following other civilian vehicles to blend in, and then turn around and speed away to make a report. If the enemy has not set up checkpoints to search all civilian vehicles passing through their position, a bold scout team may drive by frontline enemy units to conduct deep reconnaissance. American Special Forces used Toyotas in Iraq and Afghanistan for these reasons. Experts concluded that a modified Toyota Hilux (similar to the Tacoma sold in the USA) was the best choice. Light trucks can also be used in the attack. In 1987, rebels from Chad used Toyota trucks equipped with Milan anti-tank missiles to destroy a Libyan armored brigade with few losses. 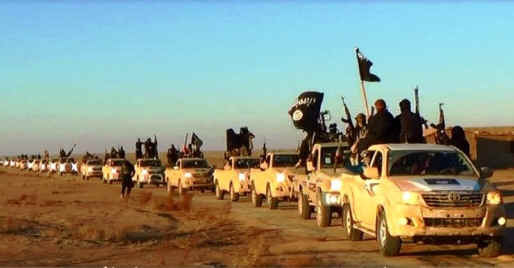 In 2014, ISIS troops swept into Iraq aboard Toyotas (pictured) and routed the well equipped Iraqi army. A convoy of light trucks zooming along a highway at 80mph can really achieve surprise, without the breakdowns and fuel issues that restrain heavy armored forces. Military experts joked that the ISIS offensive stalled after it captured hundreds of American HMMWVs and armored vehicles. They adopted these "superior" platforms that broke down or quickly ran out of fuel. Light trucks are excellent general purpose vehicles for rear area activities as they are much cheaper to operate. For example, a basic Hummer costs four times more, an armored Hummer ten times more, and they burn twice as much fuel compared to a Toyota, which is an important consideration in expeditionary operations. Toyotas are noted for their reliability while their spare parts cost much less and can be purchased in most nations overseas backed by a worldwide Toyota parts distribution system. This is not to argue that light trucks should replace all Hummers, but they can replace half for reconnaissance and general purpose transport tasks that do not require a powerful, expensive Hummer. A light truck is a poor combat vehicle, which is one criticism of employing Hummers in that role. Rugged trucks like the Hummer are valuable in rough terrain or when heavier cargo must be moved. However, if the US Army did a study it would find that most Hummers are employed in simple transport roles like base, camp, and airfield support, and to transport officers and maintenance soldiers around. Military use of light commercial trucks for reconnaissance and general purpose duties is not a new idea, it was a role the jeep and CUCVs filled for decades. This is vital since the Hummer replacement, called the Joint Light Tactical Vehicle, now costs over over $1 million each!